Have you noticed that the yogurt section of most grocery stores has practically taken over the space of dairy aisle? It’s getting harder to find more traditional dairy foods, such as cottage cheese and sour cream. But it only makes sense that a functional food with as many health benefits is given prime real estate in the supermarket. And just what are the health benefits of this healthy food? Probiotic, which literally means ''for life,'' refers to living organisms that can result in a health benefit when eaten in adequate amounts. And let us not forget that yogurt comes from milk. So consumers of such products will also get a dose of animal protein (about 9 grams per 6-ounce serving), plus several other nutrients found in dairy foods, like calcium, vitamin B-2, B-12, potassium, and magnesium. ''Adequate nutrition plays a major role in the prevention and treatment of osteoporosis, and the micronutrients of greatest importance are calcium and vitamin D,'' says Jeri Nieves, PhD, MS, director of bone density testing at New York’s Helen Hayes Hospital. ''The combination of calcium and vitamin D has a clear skeletal benefit, provided the dose of vitamin D is sufficiently high,'' she adds. ''This amount is likely to be sufficient for most young adults for skeletal health, although many would argue that for overall health, more than the 400 IU may be required, even at these younger ages,'' Nieves said in an email interview. A recent study, which followed more than 5,000 Spanish university graduates for about two years, found a link between dairy intake and risk of high blood pressure. ''We observed a 50% reduction in the risk of developing high blood pressure among people eating 2-3 servings of low-fat dairy a day (or more), compared with those without any intake,'' Alvaro Alonso, MD, PhD, a researcher in the department of epidemiology at the Harvard School of Public Health, said in an email interview. Although most of the low-fat dairy consumed by the study subjects was as milk, Alvaro believes low-fat yogurt would likely have the same effect. That's what researchers from the Jean Mayer U.S. Department of Agriculture Human Nutrition Research Center on Aging at Tufts University concluded in a recent review article. A recent Taiwanese study looked at the effects of the bacterium called lactobacillus and bifidobacterium on 138 people with persistent H. pylori infections. 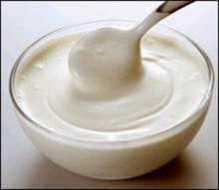 The researchers found that the yogurt improved the efficacy of four-drug therapy. H. pylori is a type of bacteria that can cause infection in the stomach and upper part of the small intestine. It can lead to ulcers and can increase the risk of developing stomach cancer. Candida or "yeast" vaginal infections are a common problem for women with diabetes. In a small study, seven diabetic women with chronic Candidal vaginitis consumed 6 ounces of frozen aspartame-sweetened yogurt per day (with or without active cultures). Even though most of the women had poor blood sugar control throughout the study, the vaginal pH (measure of acidity or basicity) of the group eating specimen with active cultures dropped from 6.0 to 4.0 (normal pH is 4.0-4.5). These women also reported a decrease in Candida infections. The women eating the specimens without active cultures remained at pH 6.0. Although those who had the yogurt snacks did not eat fewer calories at the next meal, both types of consumption resulted in lower hunger ratings and higher fullness ratings than either of the other snacks. When buying, your first decision is whether you want regular-fat, low-fat, or fat-free. You probably have a favorite brand, with just the right texture or tang for your taste buds. If so, stick with it. But do check the label for sugar content. Some flavors and brands have more than others. The other decision is whether you want artificial sweeteners (which are used in most ''light'' versions) or whether you’re OK with most of the calories coming from sugar. If you are sensitive to after-tastes, you may want to avoid the light versions. 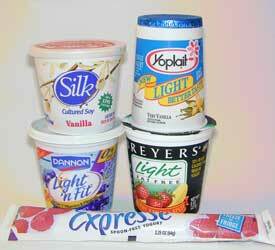 If you don't mind NutraSweet, there are lots of light yogurts to choose from, and all taste pretty good. If you want to know which specific active cultures it contains, look to the label again. Under the list of ingredients, many brands list the specific active cultures. For Activia by Dannon, for example, L.Bulgaricus, S.Thermophilus, and bifidobacterium are listed. This particular yogurt contains the probiotic culture bifidus regularis, which works to regulate your digestive system. So if constipation is your challenge, this might be the probiotic for you. Get in the habit of stirring in a tablespoon of ground flaxseed every time you consume one. A tablespoon of ground flaxseed will add almost 3 grams of fiber and approximately 2 grams of healthy plant omega-3s, according to the product label on Premium Gold brand ground golden flaxseed. When enjoying calcium-rich types, why not choose one that also boosts your intake of vitamin D? Some brands list 0% of the Daily Value for vitamin D; others have 20%. Make the perfect snack by pairing high-protein cultures with a high-fiber food like fruit (fresh or frozen) and/or a high-fiber breakfast cereal. You can find many lower-sugar breakfast cereals with 4 or more grams of fiber per serving. Make your smoothie creamy and thick by adding yogurt instead of ice cream. Cup for cup, light and low-fat type is higher in protein and calcium than light ice cream. It's also usually lower in fat, saturated fat, and calories. Add chopped strawberries (1/4 cup) and 1/8 teaspoon of vanilla extract to 6 ounces of plain type to make Strawberries and Cream Yogurt. Add canned crushed pineapple (1/8 cup) and a tablespoon of flaked or shredded coconut to 6 ounces of plain type to make Pina Colada mix. Add 1 tablespoon of cool espresso or extra-strong coffee and 1 tablespoon of chocolate syrup to 6 ounces of plain type to make Mochaccino flavour. Add 1/4 cup chopped orange segments or mandarin oranges and 1 tablespoon reduced-sugar orange marmalade to 6 ounces of plain type to make Orange Burst mix. Buy some and keep it in the office refrigerator (don’t forget to put your name on it). On those days when you need a morning or afternoon snack, that healthy option will be ready for you. Yogurt works as a substitute ingredient in all sorts of recipes. Plain types can take the place of sour cream in a pinch (over baked potatoes or garnishing enchiladas). You can also substitute a complementary flavor of this creamy healthy paste for some of the oil or butter called for in a muffin, brownie, or cake recipe. It can replace all of the fat called for in cake mixes, too.